By LUDWIG VON KOOPA - With CNN reporters like Spark Brushel on the beat, you can't trust the press. With only seven seconds of footage, Apollo Justice: Ace Attorney (3DS edition) got the least amount of air time of any game during Wednesday's Nintendo Direct. We still don't know anything new about it since CAPCOM announced the port a month ago. It was a useless seven seconds. Apollo Justice is NOT everyone's favourite lawyer. He's not even most people's. Apollo Justice: Ace Attorney does not explore Apollo's origins or backstory. You'll need to play Phoenix Wright: Ace Attorney — Spirit of Justice for that. Before that was Apollo Justice: Ace Attorney, and that was a long, long time before KoopaTV started. It's not the next game in the series. It's not even the previous one. It's the previous game to the previous game's previous game. That's going real far back. Shame on Nintendo for putting this information in a press release. You know what I call that? Ludwig wanted to continue KoopaTV's meme war against CNN, and this is the result. He's astonished in general that Nintendo would make such a bold claim about Apollo Justice: Ace Attorney being a new game. Of course it isn't. This is far from the first time that Nintendo's marketing communications outfit has put out demonstrably false information to promote a 3DS game. Believe it or not, this article doesn't even cover all of the FAKE NEWS in the seven second soundbite and tiny blurb. There's even MORE, as revealed next week. Fake news isn't enough: Nintendo actively wants to censor the game's existence. CAPCOM gives true news about the game's release date and its actual events. CAPCOM might have used FAKE NEWS to promote the game on launch, but there is no way to fact-check it. Don't trust Nintendo to write accurate press releases about their own products, either. The CNN meme war finally comes to 2018, with a clear example of FAKE NEWS actually done by CNN. 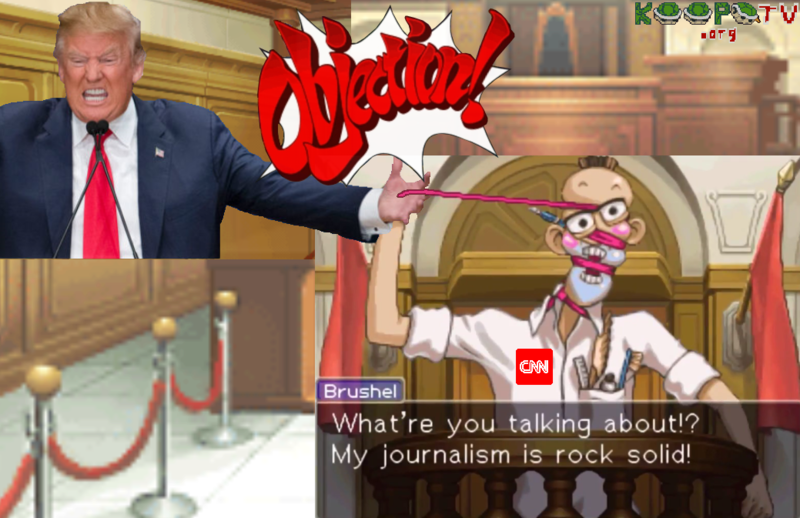 The first case in Apollo Justice happens to be called Turnabout Trump. Is it merely a coincidence that Trump is president? I think not. Turnabout Trump takes place in 2026. Donald Trump Jr. for president 2024? Eh, Apollo has more fans than you think. Also a bit of Apollo's backstory is touched upon, but not heavily. Then again, Ace Attorney Investigations 1 hardly touched up on Edgeworth's backstory, but the second one did, and for some bloody reason we still have not gotten that game. We only can play the fan translation. Other than that, I agree with the article. I am not surprised honestly that Ace Attorney Apollo Justice was rushed like that. In fact the Ace Attorney series, although a lot more popular than it was because we can now get it for a lot cheaper than 12 years ago. Capcom still doesn't want to release some of the games here. Still waiting on The Great Ace Attorney 1 and 2. "I'm a fan of Phoenix Wright and I have a family I don't know about since it's not even revealed to me, so as far as I know, I'm here to just be a fan of Phoenix Wright." is the extent of Apollo Justice's backstory in his game. You get more in Dual Destinies than that, honestly. And obviously Spirit of Justice. Let's put it this way: "uncover the mysterious origin" for Apollo just doesn't happen until Spirit of Justice. Apollo Justice just establishes he exists. The advertisement deemed Apollo as everyone's favourite lawyer and I'm pretty sure Phoenix Wright is far, far more popular. I don't even think Apollo is hated or anything... he's just not THE favourite. But, yes, we've been waiting for official localisations of the Japanese-only games too for a while and have been trying to push for that. Now that CAPCOM is going to re-release Ace Attorney Trilogy on non-Nintendo platforms, you can bet they'll re-release the next three games, along with the 7th, and that'll take years before they can work on the backlog of Investigations 2 and Great Ace Attorney. The True Spirit of Justice — Not On Mobile! Kirby Battle Royale: Copy Ability Poll! Should The Number Nine Be Nixed? Miiverse Downloading Your Post History FAQ!